To observe and compare the pressure exerted by a solid iron cuboid on fine sand/wheat flour while resting on its three different faces and to calculate the pressure exerted in the three different cases. Solid iron cuboid of appropriate size, spring balance, clamp, stand, trough filled with fine loose sand, scale, temporary marker or chalk and wooden sheet. Pressure of solid on a solid. where, P is the pressure, F is the applied force and A is the surface area where the force is applied. Measure the dimensions of a cuboid with the help of scale and mark them l, b and h respectively. 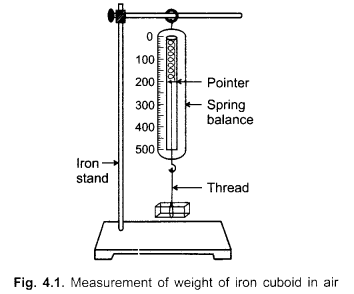 Measure the weight of a cuboid with the help of spring balance as shown below. Record your observations in table A. Note: See Experiment 2 of term II for the procedure of measurement in detail. Level the surface of loose sand in the trough with the help of wooden sheet. Lay the cuboid on the loose sand on its widest base position, l x b, first as shown in Fig. 4.2. Observe the depression of solid in the sand. Note the observations in two different cases of step (6) in a similar manner as in step (5). Let it be x2 and x3. Repeat the experiment two more times for three different cases of cuboid. Record the observations in observation Table B.
side base position =…………… mm. Spring balance should be sensitive, stable and error free. Spring balance must be suspended vertically from fixed support of iron stand. Eye should be kept in line (exactly horizontal) while taking the reading of spring balance. Reading should be taken only when oscillation of hanging object dies completely. Zero error, if any, should be taken into account. Loose sand must be used. Same cuboid should be used for the three different cases as different cuboids have different weights and dimensions. Cuboid should be placed gently on the sand. Caution should be taken while marking on the cuboid. Sand must be levelled properly after taking every observation. Mean height of mark on the cuboid from the base in three different cases shows that the effect of thrust on sand is larger while standing upright than while lying side base than in widest base. Smaller the area over which same magnitude of force acts, greater will be the pressure applied by the object. What is the aim of your experiment? To observe and compare the pressure exerted by a solid iron cuboid on sand while resting on its three different faces and to calculate the pressure exerted in the three different cases. What observation is made by you in this experiment? The effect of force is greater when the area of contact is smaller. In which position of cuboid, the effect of force is the greatest? When the cuboid is in upright position. The upright position of cuboid has smallest area of contact which increases the pressure exerted on the loose sand. When is the effect of force minimum? When the cuboid is laid on its widest base position. It is defined as the force exerted per unit area. How is the area of contact to the force acting over it? Since P = F/A, so, for the same magnitude of force, pressure is inversely proportional to area. Hence smaller the area, the greater is the pressure and therefore, the larger is the effect of force. What is the unit of pressure in SI system? The unit of pressure is pascal (Pa). Why do nails have pointed tip, knives sharp edge and buildings wide foundation? According to the basic concept of pressure, the effect of thrust depends on the area on which it acts. Therefore, for the same magnitude of force acting on a smaller area exerts a larger pressure and a smaller pressure on a larger area. This is the basic reason behind these happenings. If you swing around on one leg of a chair, how much pressure do you put on one point of the floor as you do if you sit properly? Four times as the total pressure is 4P which is distributed equally among four legs when we sit properly. But now the whole pressure is exerted by one leg of the chair on the floor. What is the difference between force and pressure? The force exerted by the object on the surface is equal to its weight while the pressure exerted by the object is the force exerted per unit area. Do all forms of matter exert pressure? Yes, all forms of matter— solid, liquid and gas exert pressure. In case of solid and liquid, pressure is exerted by the weight of an object over the area on which it acts. And in case of gas? It is caused by the motion of gas particles which travel through the space collide with the objects (such as wall of the container) and exerts a force on it. The force exerted per unit area of the wall causes gas pressure. Which of the following statements is true for the pressure exerted by a solid body? To observe and compare the pressure exerted by solid iron cuboid in its upright position, student ‘A’ placed the cuboid gently on the loose sand while ‘B’ placed it on the surface of table top. Who will observe the exerted pressure by the cuboid easily? In a school trip to Rohtang pass, Manali, student A wears wide base shoes and student B wears narrow base shoes while walking on the ice. Who will be able to walk easily and comfortably if both the students have equal weight? (d) same force acts on each face of cuboid. (d) Aluminium cuboid and coarse sand. An iron cuboid of dimensions 12 cm x 5 cm x 2 cm is placed on a bed of sand. 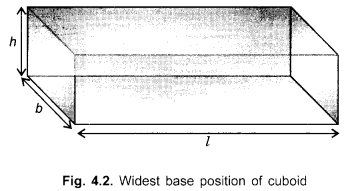 Which of its surface in contact will apply the maximum pressure on the sand bed? (d) The pressure applied will be same for all the surfaces. (d) same in all the three cases as the thrust is same.